Revenue at e-commerce giant Alibaba jumped 60% in the first three months of the year, powered by a growing customer base in China. More than 450 million Chinese shoppers used its sites during the quarter, with the average annual spending up by about a third, Alibaba said. The growth pushed revenues for the period to $5.6bn (£4.3bn). But investors weren't satisfied, sending shares down 3% on Thursday. Alibaba, started by billionaire Jack Ma, is the dominant online retailer in China. The Chinese business accounts for 67% of Alibaba's revenue, or $3.7bn - a 41% rise on the same period last year. Like its US rival Amazon - which claims more than 300 million customer accounts - Alibaba has expanded into a wide range of services, including cloud computing and media, via its Youku Tudou video hosting service. Alibaba said it had more than 870,000 customers for its cloud computing services at the end of March. Quarterly revenue from that unit doubled from last year, reaching $314m, the firm said. Digital media and entertainment revenue grew even faster, rising 234% year-on-year to $571m. 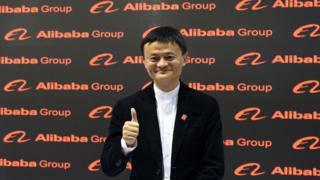 Alibaba has said it also plans to expand internationally for future growth. International retail sales in the quarter more than tripled from 2016, to $353m. The firm acquired the Singapore e-commerce site Lazada last year. Total profits in the quarter were $1.5bn, up 98% year-on-year. "Our robust results demonstrate the strength of our core businesses, as well as the positive momentum of our emerging businesses," said Maggie Wu, the firm's chief financial officer.